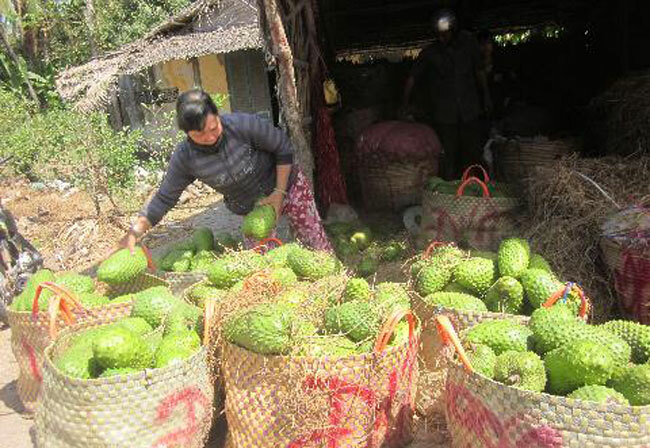 HCM CITY (VNS)— Over the last several years, many farmers in Tien Giang Province who once grew rice have escaped poverty by switching to soursop cultivation. Dao Van Dong in the province's Tan Phu Dong District, for example, earned VND75 million (US$3,500) from selling 10 tonnes of soursop in the last harvest. Dong, who has a 0.5ha soursop orchard in Tan Ninh Hamlet, said his family was no longer poor. The family once raised pigs and grew rice but had earned a low income. "At that time, my children had to go to other places to work as hired employees," he said. Similarly, Bui Trung Tin in Tan Phu Commune said he had been earning a yearly income of more than VND100million ($4,700) from his 0.5ha of soursop orchards. Five years ago, Tinh began intercropping soursop trees on vacant mounds of his paddy field. When his soursop trees begun to bear fruit after three years of planting, he stopped growing rice. The district is plagued with saline intrusion and acidic soil, and only a few kinds of trees, such as soursop, can grow in the soil. Located between the mouths of Cua Tieu and Cuu Dai rivers in the Cuu Long (Mekong) Delta, the district now has 540ha of soursop trees. Nguyen Van Hai, head of the Tan Phu Dong Agriculture and Rural Development Bureau, said more than 400ha of the district's 540ha of soursop have borne fruit, mostly in Tan Thoi, Tan Phu and Phu Thanh communes. Nguyen Van Thuong, deputy head of the Tan Phu Commune Farmers Association, said soursop, which has a high nutritious value, had been in demand in recent years. In Tan Phu Commune, which has the largest soursop cultivation area in the district, nearly 600 households grow a total of about 300ha of soursop. Tan Phu has a soursop co-operative of 50 members and 30ha of soursop under cultivation. The co-operative guarantees buyers for its members. Local agricultural officials have taught farmers new techniques, including how to grow trees that bear off-season fruits. Soursop has two peak seasons a year, at the beginning of the rainy season and before Tet (Lunar New Year). The price of soursop is stable and farmers can earn a profit of VND150 million per ha a year, local officials said.